When December 2018 hit, we realized we had one custom Gerstner tool chest left. As much as we loved admiring its beauty at Doosan’s HQ, we knew it needed a new home. And a deserving one. With Christmas around the corner, we decided to give it away. But instead of your traditional “like and share this post to enter!” contest on social media, we asked our audience to do something a little different: to get into the giving spirit themselves. The idea: Don’t nominate yourself. Nominate someone else. So we posed the question: Who do you know that deserves our last tool chest? We got a bunch of fantastic nominations, but one of them stood out above the rest. It came from a shop in Watertown, Connecticut. “I nominate our CNC Manager, Alan. He has been a toolmaker for 30+ years and transitioned to CNC machining some 20 years ago. Al deserves a new toolbox because his current one is small. 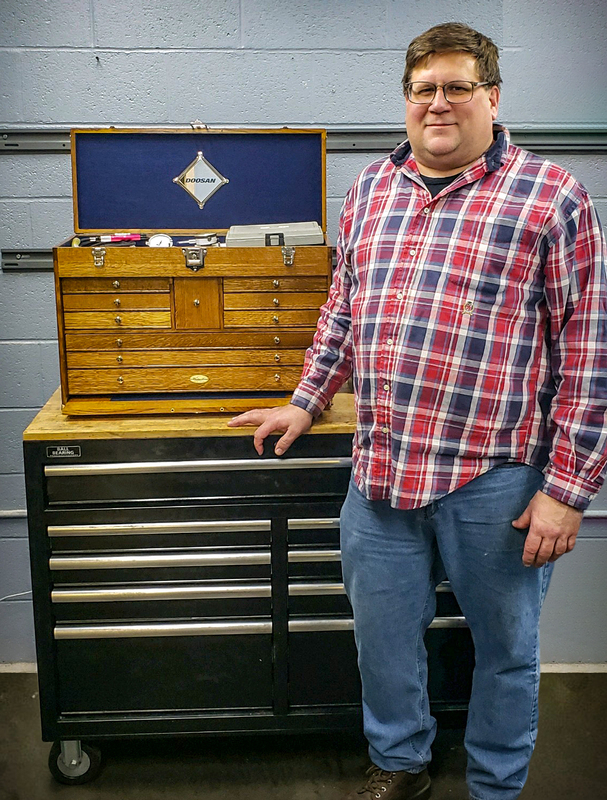 His current toolbox was handed down to him from his father and is very sentimental to him. I have known Al for almost 30 years and have always known him to be one of the best toolmakers in our area. He has had some problems with drugs and alcohol in the past that caused him and those around him some heartache, and he lost many things. But rather than end up dead, Al was able to pull himself up and— with the love of his friends and family—he has persevered and stayed sober nearly 6 years. His talents have only come through better since being sober, and he is an inspiration to all that know him. As a friend and colleague, I have always had the utmost respect for Al and his abilities in the trade. We are so fortunate that he decided to become a part of our team at Prime and he started making a difference on his first day. Al’s nomination was written by his colleague, Paul. Both men work at Prime Engineered Components, Inc., and the two of them go way back. When Paul started in the industry decades ago, he was not a machinist. He started on the bottom of the totem pole and worked his way up. Al was instrumental to Paul’s growth early in his career, and Paul never forgot it. Soon after starting at Prime, Paul started calling Al to see if he wanted a new challenge. After a solid year of pestering, Al decided he was ready. He started at Prime in October 2018. He came from a family of toolmakers, so this has always been in his blood. He was always learning and always growing. In the mid-80s, he progressed into CNCs, wire EDMs and sinker EDM programming. While his work life grew, his personal life grew rocky. He married young and had kids young, so he held multiple jobs to make ends meet. He needed a way to cope with the grind, so he developed bad habits with drinking and drugs that went on for years. After a little over 20 years, it all fell apart. He and his wife divorced, he lost his house and spiraled downward. He sold most of his stuff (including, oddly enough, his top-of-the-line tool chest) to get by and to keep those habits going. But all the while, Al kept working hard, which is why he’s always had guys like Paul in his corner, rooting him on. Al remembers the exact day. June 18, 2013. “That was when I decided I was done with drinking and drugs. I finally got my crap together at 45 years old. I just kept getting better and better. I knew I couldn’t change what I did before, so I had to make tomorrow better. I got heavily involved with a 12 step fellowship, and now I speak at meetings and at houses for young kids to let them know that there’s another path. Improve and grow. It’s been Al’s philosophy for decades, and he’s still doing it. All of us at Doosan want to congratulate him on taking home our final Gerstner. We hope it continues to motivate him to stay clean and to work his tail off for years to come.